Traveling throughout different regions of the country allowed me to immerse deeply into the culturally rich history of Spain. I set out on this trip with the goal of stepping outside of my comfort zone and gaining a new perspective, both of which I can say I accomplished while in Spain. I will never forget the bonds and friendships that were made on this adventure. From the sights and sounds to the festive nights that bled into breathtaking sunrises, there is a beauty to Spain that words cannot capture. The activities we participated in were just as diverse as the regions were. 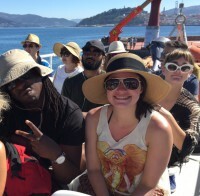 We sweat it out dancing flamenco in the heat of Madrid, sunbathed (and did floating dock yoga) in the dreamlike beach town of San Sebastían, built mud huts on a mountain overlooking the rocky coastline of Mougás, and everything in between. This trip was by far the highlight of my college experience and I am so thankful for the friendships that were made and the experiences we shared. Spain was definitely one of the most, if not the most exciting thing I have ever done in my life. Suzanne did an excellent job organizing the trip. I never thought that I was much of a history buff but Spain really brought history to life in so many ways. I enjoyed visiting the churches and especially enjoyed the food and night life that Spain boasted. Spain was a life changing experience. I learned so much about the beauty and diversity of an amazing country. I also felt safe and able to be my self. Because of that, I gained confidence and self worth. Every penny and every minute was worth it. I would go back again in a heart beat! Studying abroad in Spain was one of my best adventures yet. Discovering Spain was a perfect opportunity to discover. The challenges of planning for the trip, the challenges of the language barrier, and the financial challenges pushed me to step out my comfort zone and embrace Spain, a sense of a place that I will never forget. As an experienced traveler I had no doubt that the Discovering Spain program would be fun. However I could not predict just how rewarding the trip would be for me. It was a perfect balance of scheduled group activities along with free time to explore. One of my favorite things we did was build a Bronze Age inspired mud hut with our hands. By the end of the trip I felt like we were all family. I'll never forget our time in Spain and the unique opportunities given to me. Thank you Suzanne and PSU for making it happen!